Kraft paper bags are sold in packs of 6. They measure 260mm wide and 320mm high. An eco-friendly alternative to the infamous plastic bag! available in packets of six for convenience. an ec0-friendly alternative to plastic bags. Kraft Paper Bags are a visible way to show your support for protecting our world from non-biodegradable products. 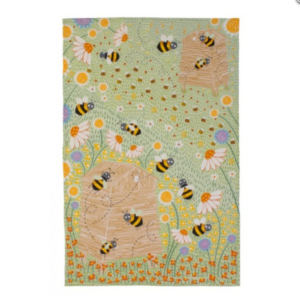 complete with original classic bee design to enhance your gift giving. dimensions are a generous 260mm wide and 320mm high for good capacity. Paper stitch carry handles provide you with ease of transport. great way to up-trend your shop sales with co-ordinated bee theme – you can easily stamp with your company details or attach a sticker to personalise your bags. price is for a pack of six.